Library student worker prepares laptop for checkout. Palo Alto College’s library began a new laptop service that will offer eight laptops for checkout to current Palo Alto students. Tina Mesa, dean of Learning Resources, is on the forefront of this new service that opened on February 17 this Spring 2014 semester. “The laptop checkouts are more to assist students who don’t have technology,” Mesa said. In order for students to check out a laptop, they must be enrolled in this Spring 2014 semester and sign a form of agreement with their Banner ID and PAC ID. The take-home laptops are Dell Latitude 2100 models, which come with a protective case and a charging cord. This new service allows students to take the laptops home for a period of 30 days. The laptops may be checked out at the library’s circulation desk. An overdue laptop is fined at $25 per day; other fees, such as physical damage to the laptop, are mentioned in the form of agreement when first checked out. Laptops must be returned in person to the circulation desk in the library. A promotional email will be sent through ACES to introduce the new program. Though advertisement for the new service is on email and posters, there are those who do not check their email every day and who do not stop to see the posters that are hung around campus. Information Technology Major Dominique Hernandez, sophomore, who attends the library on a daily basis, is one student who had yet to hear of anything concerning the laptops. 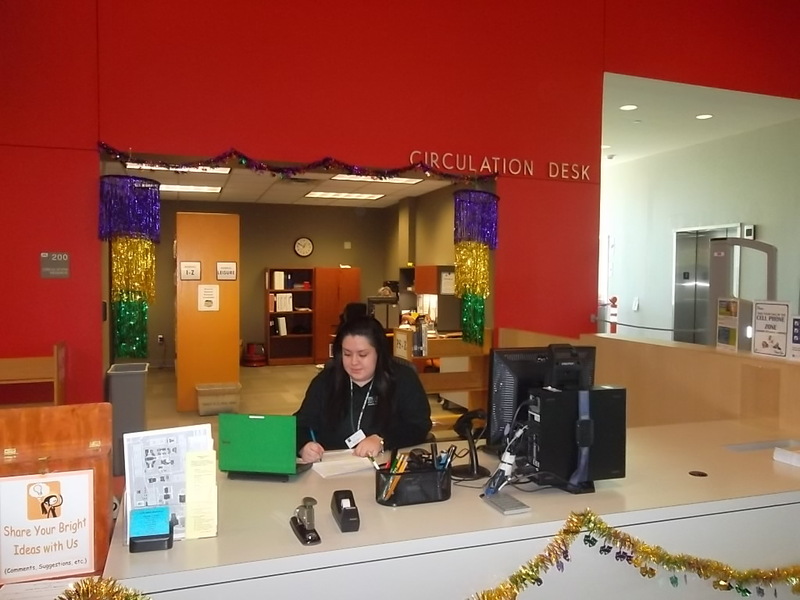 The benefits of the new service, as Mesa explained, are to read the library’s e-books from the laptops and to help students with their coursework. The library’s Internet resources, such as e-books, can be found on the college’s library website. The library has over 28,000 accessible e-books for use that primarily support the curriculum. Downloading e-books is possible as well. More than that, the Palo Alto College website will give access to the library’s catalog when students enter the library site. A few issues, caused checkouts to be delayed from starting at the beginning of the semester, but Information Technology has been at work alongside the librarians to prepare the laptops for proper use. Sanchez said that she would like to personally thank IT for all of their services. Besides the laptop checkouts, new technological devices will come in the future for use in the library, Sanchez said. These future services include four iPads tethered to tables with STEM-related games, a proposed T.V. for 24-hour news, an Xbox 360 with Kinect games to have students physically moving and other technological devices that will be available in Ozuna Building, Room 201, for educational use.